You are here: Home / How-to Graphics / Where to Find Images for Blogs and Social Media: Free and Legal! Where to Find Images for Blogs and Social Media: Free and Legal! NOOOOOOOOOO! (My reaction pictured below). The Favorite Way to Find Images for Blogs is the WORST Way! We live in a visually-driven world. Web surfers with little time to read have many blogs and social media sites competing for their attention. To grab their attention and communicate quickly, you need compelling images. Couple this need with the best search engine on the planet and you’ve got – a whole lotta copyright infringement goin’ on! Every week I’m amazed to hear another person – who should know better – tell me they’re using the wonderful search tool Google Images to find pictures for blogs and social media. “Haven’t you noticed the words ‘Images may be subject to copyright’?” I ask. I usually get a puzzled look in response. If you’re Googling images to reuse – please cease and desist immediately. 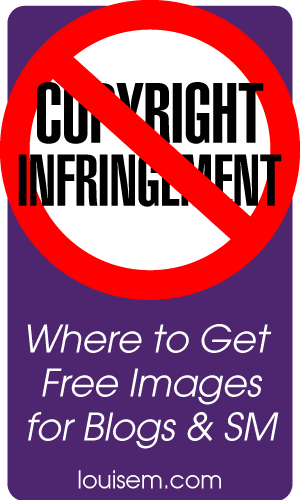 I’ll tell you where to find images for blogs and social media that are still free, yet legal. Photo used by permission. Scream by Crosa via wikimedia. Where to Find Images for Blogs and Social Media – Free and Legal! Stock.XCHNG: The Stock.XCHNG (or SXC) is a free stock image site where you can use all of the photos for free, most without providing attribution. You can easily search over 350,000 images though you have to be careful to follow the exact license as many photographers add extra terms to their images. Flickr: Though most of the content on Flickr is copyright protected, you can use the advanced search on the site to look up relevant Creative Commons-licensed photos and artwork. Be careful when using CC-licensed images to ensure that you follow the terms of the license completely. Wikimedia Commons: Wikimedia Commons is Wikipedia’s media end and it has a slew of images available under a variety of licenses ranging from public domain, meaning no copyright, to Creative Commons. Just be careful to reach each license carefully and make sure you comply fully. U.S. Government Websites: Finally, any and all content produced by the U.S. government is automatically placed into the public domain and is available for use. So, any images you find on a “.gov” site can be used freely, unless otherwise specified. List from Gautam Hans’ post on SocialMediaToday. Caution: Gautam’s post says you can use advanced search on Google to limit to Creative Commons work. Be careful that the uploader has the right to make this claim, i.e. they created the art. Icons Etc. – Icons Etc. offers 128,743 free icons and clipart stock images for web design, application design, graphic design, and many other purposes. All Icons Etc. royalty free stock icons, and stock clipart are free for use in both personal and commercial projects. I like that no attribution or backlinks are required. Iconfinder – Be sure to check the license filtering. Some images aren’t allowed for commercial use, and some require a backlink. But this site does have a great search engine, and a simple dropdown bar to select the licensing that’s appropriate for your use. This one’s a crapshoot. You are trusting that the original “pinner” hasn’t infringed on someone’s copyright, and that they won’t delete the pin. I’d avoid this unless it’s your own image from your own pinboard. Where to Find Images for Blogs and Social Media: Good, Fast & Cheap! If time is more precious than a dollar or two, here are my favorite sites for professional, royalty-free images. Forget about wasting time poring over hundreds of not-quite-right free photos and do what the pros do: go royalty-free. With either of these sites, a small image runs as low as $1. (Prices checked October 2013). Fotolia* – Buy a pack of credits for as low as $19.60US. A bit more expensive than dreamstime to get started, but in the long run their prices seem a bit lower. I also find their website clean & attractive, so this is my go-to site now. It’s really important to attribute free images. Here is a good article on proper attribution. The royalty-free sites I mention don’t require attribution. However – there are restrictions on use. One that surprises many folks: you may not use the images on anything you sell (like T shirts) without buying a special (and much more expensive) license. Usually you can’t resell either free or royalty-free images. Some licenses restrict altering the images. Check first! Note: I’m not a lawyer and none of this is meant to be legal advice. UPDATE 9-9-13: New post! Check out this extensive list of free photo sites. Currently 19 sites on the list, and you can vote on them or add more. Even embed the list on your own site! That’s it! Pin or bookmark this post for the next time you’re wondering where to find images for blogs and social media! Always a problem finding great images. I use Dreamstime for most of my images but it gets expensive and I often can’t find what I’m looking for. What do you think of Google Advanced Image Search (selecting free to use – even for commercial use)? Thanks for your continued efforts to help everyone with their blogs. Kathy, I don’t trust Google Advanced Image Search. 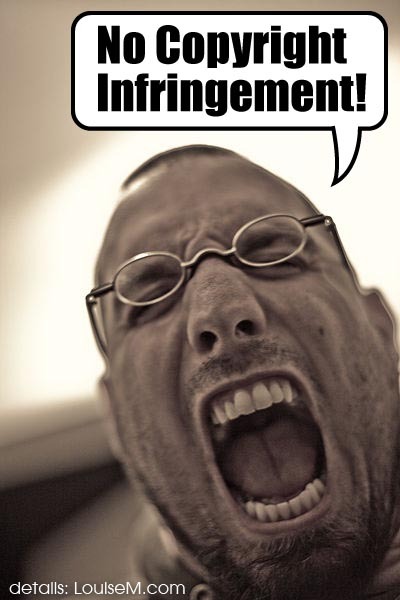 People may use images that are under copyright unknowingly, then say it’s OK for others. Go with wikimedia for free images b/c there’s no doubt about the licensing – it’s all spelled out for you. And you should be able to find just about anything you can think of on dreamstime. You could try fotolia for a change, tho many of the images will be the same. The link is above ^. You take a risk IF you don’t know where the images are coming from. I’ve gone after people who have used my images on their site ONCE I found it! I’m in a group and someone shared how she quoted a blog, actually I think she took the article and put it on her blog or a client’s blog, giving credit of course, but the image that was included belonged to one of the BIG stock art sites and they SENT HER A BILL, for some BIG bucks! This is a little unrelated, but it’s in the realm of image creation. – I’ve spent this past week looking for Photoshop Brushes. There are loads out there for what I want, but their TOS does not meet my criteria. The thing that amazes me is that they don’t have pricing for those who want to use for commercial purposes and theirs are not applicable. I WOULD BE afraid to just take the brush and use it in my artwork. So I’m still looking! You’re correct, when you use images online you need to confirm the source and any usage restrictions. Yikes, you should NEVER pull images off someone else’s blog! I know that you, as an artist yourself, are super conscientious of these things. The Scream is in the public domain in the US, because it’s copyright protection has run out. It will be in the public domain in Norway in 2015. I would have thought so, but you know how suspicious I am. The 2 people who had posted it as “free to use” had no affiliation with art. So, I prefer to be safe than sorry. I think using Google images to search for public domain pics is not a good idea because there are too many illegal pics in their search results. Go with Wikimedia as your main source and first searching place. Thanks Jim, I agree, there are too many people who don’t know better – I can’t trust what they say to be legit. Thanks for the great information in this post Louise. I know finding images for blogs etc. is a major hassle for all of us, BUT we must keep legal. I’m bookmarking this page. I’ll be using it often. You should check out the Zemanta.com plugin. Free embeddable images plus a bunch of other great blogging tools. That looks quite interesting! Thanks for bringing it to our attention. Another good source is http://www.123rf.com – $1.00 images! I’ve heard a lot about that one as well. Thanks! There are many illegal image online which we can never stop from spreading. Even you yourself, can have your image copied by other people. Of course this is true. I find that most people just need to be informed that reusing any image they find online isn’t OK – tho there are definitely people who purposely “steal” images. It’s becoming easier to locate those stolen images – but you can’t completely stop it. This is just my campaign to raise awareness among those who would comply with copyright rules if they knew how! I really appreciate this article. It’s the same challenge musicians face. Following copyright laws is critical to the success of the artists in the world. Well said Stacey! The best we can do is to educate people. I think most will want to comply when they understand. Thanks for your comment! This is a great post. I will certainly use this one along with one that I saw Jim put up before. I have taken to using fotolia as they have good pricing though the images are a little sterile. They often ask for attribution as well though. I think it is a good practice to take a small camera with you all the time and take everything…simple mundane objects and views. You never know when they will come in handy and you can guarantee that your blog will be the only one with that image. Fotolia does say they “like” to get an attribution but it’s not required for paid images – standard license. Have you seen some Fotolia images that make a special requirement of it? Great post and very useful. Specially need this information in the world of FB Timeline and Pinterest!! Thanks!! You are so right about that! Thanks for reading and commenting. Great helpful hints and sources. Thanks! Lulu – great info! Thank you for researching and posting this piece! I bookmarked it! Very helpful! Hey, I think I recognize myself as one of the ones who said, “Duh, I get my images from google – why?” and looked confused when you about clobbered me in response! 🙂 xoxoxo Thanks for the great article! Thank YOU for inspiring a very popular post! Thank you Christina! Appreciate your comment. Thank you for a great article, Louise. I find my food photos turning up all over the web. Thanks for helping spread the word, Clare! Best of luck with your business, and keeping the “photo poachers” at bay. I was really confused on how to find a free image. I found more images on the internet – most of them are copyrighted. Thanks for sharing this useful information, it’s a very useful post. Hi Maia, I’m glad this helped! We need to assume that any image found on the internet is copyrighted unless it says otherwise – that’s why these sites are useful. Is there copyright on all the Facebook quote images? Can you re-use the quote on another image? Can you post the Facebook image to Pinterest? For anything found online, you have to assume that whoever created it holds copyright to it, unless they specifically state otherwise. Short quotes must come under fair use laws, as using them seems to be widely accepted, so I see no reason you couldn’t use the words for your own picture. Yes, there are workarounds to pin from Facebook, but I can’t recommend it, since the pin won’t link to the original source, which should always get the credit for their work! Thanks Louise for providing all these wonderful, helpful details. I’m going to start adding copyright information on my original graphics that I add to my blog and to Pinterest. And I’m loving all the free resources here. You are great! Wonderful to hear Kristy – thanks so much for your comment! I buy royalty-free images for my blog. Is there a way for people to NOT steal the images that I use? I’m asking because I don’t think it’s fair that here I am paying for images and others may be stealing and re-using them. Do you know it’s legal for me to post the link of my website to royalty-free pictures that I’ve purchased? That way if the image with a quote I posted on it floats on the internet, people can know that if they come to my site, they’ll see more pics and blogposts? I wish there were a way! I keep trying to educate people, but they (even some of the ones who hear me) still don’t get it. If you’re asking if it’s OK to put your URL on images for your blog as a watermark – I believe it is. I put my URL on images I’ve bought, but not a copyright symbol, unless I’ve substantially reworked the image. If people do steal images you’ve bought, they may be sued by the stock company! I’ve read of people getting huge bills for using images illegally – even if they didn’t know it. That’s why I recommend people stay away from Flickr and other sites where you can’t verify the true source, and if it’s *really* OK to use. Louise — great info. I’ve always been concerned about copyright infringement on my blog, which is why I have typically retrieved images from Wikimedia and Flickr. However, I recently started using a plugin called Photodropper, which has a library of CC images that you can choose from within your post. It will also automatically give image credit. I use the free version, but there is an upgrade option to a bigger library that is $3 per image (I think). That sounds great, thanks for the suggestion, Tom. Thanks for compiling this list.In the past I’ve used Flickr only as I was not aware of any other similar site but now I can find a lot more images. After reading your blog post I have checked wikimedia commons and they also have a really impressive collection. Wikimedia is truly useful as they are totally on top of copyright and attribution issues. I’m wary of Flickr, as users there can upload images that others own the copyright to. Interesting discussion. I recommend istockphoto and Big Stock for clients that wants photos on websites. They both have a standard license agreements on their site that covers using photos a website and use in a blog post. Blog posts need to have the proper credit format (each one has a slightly different format) I also now make a lot of my photos in photoshop and/or take my own pictures. istockphoto and bigstock both have great phone customer service that walks you through the agreements so you have peace of mind. I’ve recently heard rumors of people getting bills but if they paid for the photos and are using them properly they are covered in their standard license agreement. Thanks Sabrina! Those are good sites too. IStock is quite a bit more expensive than Dreamstime and Fotolia, which I recommended in the article. Neither of those requires attribution for purchased photos used on websites. or other advertising materials. What a lot of people don’t understand is that you can’t use ANY of these royalty-free photos on items for resale without a special extended license. That’s where they may be getting into trouble. I’ve also heard of people getting billed by Getty Media for using photos they didn’t pay for. Bottom line, don’t use stuff you find online without knowing the rules! Louise: This is the second post of yours that I have read. Excellent information with some really good tips. Are you sure you are not a lawyer? Just kidding. You mentioned designing your own logo. Have you done this? Can you recommend software to use to do this? nice post, so how can one get to know the real origin of the image? You can try using tineye.com. It’s also a way for image creators to discover who’s swiped their images. thanks, i never knew i was doing it the bad way. using unlicensed images does go against Google tos? I don’t know about Google TOS, but you’re breaking copyright laws if you use images without permission – which I think is a bigger deal than anyone’s TOS! Hi, and thanks for this helpful info for others! However, I’ve read and re-read this article and some others regarding the use of Creative Commons Licensed images, but I still don’t think I understand completely. It might be what my fellow Fibromyalgia-fighters and I call “fibrofog,” because I don’t usually have this much trouble understanding this kind of stuff! Please help? What I would like to know is: if I use CC images (in their original form and/or with edits that I’ve made) in pictures that I have made for my Facebook page (which is totally non-profit, just for humor and inspiration), what kind of attribution do I need to put on the picture? I haven’t posted anything like this yet, but I am working on several pictures that I want to post on that page, if I can ever figure out how to do it legally. Maybe explain super-simple? I’m in the midst of a flare of my Fibromyalgia, and it could be a while before I’m back to my normal comprehension level! Thank you SO much in advance! There is no doubt that creative commons licensing is a complicated and confusing issue. I’m sorry that there’s no simple answer. There are many types of licenses available, and the creator of the work gets to choose what usage they’ll allow, and what kind of attribution they require. So unfortunately you have to check each piece individually. Thanks so much! I think I get the overall idea, and I spoke to someone who is going to help me when I am not sure what to do for any of the images. It’s not a big deal if I can’t use them, I’d rather do the right thing. Generally if you give them credit and don’t try to claim the work as your own, I think you’re OK. But I’ve never been able to confidently decipher it myself! Great article. We tend to use the more widely available images and credit the publisher site – the link out to another relevant site that complements the article being written is useful and it has at times led to engagement with others in the same industry, helping build out connections. Just a different approach to note. That’s not something I could recommend. Using others’ images without permission – whether you credit them or not – could get you sued for copyright infringement. If you get permission first, then sure, it’s a great way to connect. This my website, its only a few weeks old http://www.imgparty.com/ but hey im trying hard. Nice! Thanks for sharing, Mark. Hey Louise, Thanks for the list. At upicm.com we decided to cut to the chase and get rid of all the confusion re. creative commons license and public domain etc. All images are completely free for personal and commercial use with no attribution required ever. You can even incorporate our pics into your products for free with no limitations on the number of products. We create all images on the site ourselves so we can stand over their free legal use. Also, all images have been optimized for web use which can save a lot of time. We’re just getting started but thousands more pics will be added soon. Including Facebook covers, Backgrounds, Nature Pics, Urban scenes etc. – Regards, Declan. Thanks Carl! Readers, be sure to check the licensing requirements and enjoy. ps: watermark your images! And even better, embed your own link into the image tag. If everyone did that, this would be a moot point. Clicking on the photo would automatically take the viewer back to the owner’s website! It’s great advertising for you if you’re selling a service. However, there are photographers who actually sell – photos! And they don’t like it when people take them for free. Can you explain what you mean by embedding a link into the image tag, that will take the viewer back to the original website? I know Pinterest will link back to the site where found, but if someone uploads an image to their website, I’d love to know how that could automatically link back to the original site where found. Stolen images also abound on Instagram, where the photos don’t link to anyone’s website. I appreciate your enthusiasm, but there are many people who steal photos, obliterate or cut off watermarks, etc. It’s not quite as rosy as you make it sound. If you want people to reuse YOUR photos, by all means, encourage that. But please don’t suggest that everyone should be equally happy about having their images taken. I doubt photographers would agree that their creations are “not like music.” They deserve to be paid, just like any artist. Oh dear, I believe that we are talking about two very different things. I am not talking about photos for sale! That IS robbery and definitely wrong, no matter what! I’m an interior designer and sometimes use others’ images to express a point but make perfectly clear that it is not my work. These are photos that have already been published in magazines. The photographer was already paid and would not receive a royalty in any case. Then, I go and find the original source to link back to. Although, I often see people linking back to someone’s blog, or pinterest or something that’s not the original source. And yes, I’m well aware of the cretins that abound on instagram using other people’s images as their own and it’s disgusting! I’ve only reposted something once and it was from a friend. Otherwise, they’re supposed to be your own images! If you want to put up other peeps pics, that’s what pinterest is for! I did have an image of mine stolen and it was used as someone’s business card in an advertisement for her business. my room and also my photo! My husband called her up and gave her an earful. He said she sounded annoyed. huh? As for embedding a link into the image tag, sorry, I’m mistaken. That would be nice, but not possible. What I meant is to use your name in the alt-tag. So, that means saving the photo with your name, like “laurel bern interiors living room blue sofa.jpg.” You can’t link back directly, but at least you will have the attribution back to yourself. Maybe half of the images I see do this. Even if the original source doesn’t have it, I’ll put it in for them so that the next idiot can plainly see who to credit the image too. I also always add in the name of the source in my description on pinterest. And please allow me to make it clear that I don’t want people to just reuse my photos. I want them to link BACK to me with the photo and there’s a very big difference. If they use my photo without the link, then yes, that’s also stealing and wrong. I truly appreciate people who take the time to find the original source of images to credit and link back to. I feel so strongly about that. I get tired of people posting others’ images and linking back to a google search! I completely agree on watermarking. I’m always encouraging people to add a watermark, even though unsavory types can easily remove them with Photoshop. Fortunately, they’re in the minority! Thanks for this article Louise! 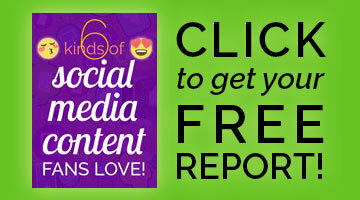 It’s very helpful for everyone who deserves free amazing resources.